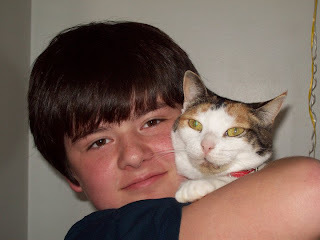 FROM CAT CHAT WITH CAREN AND CODY: As we approach the start of Poison Prevention Awareness Month, (which frankly should be EVERY month), we would like to repeat a post that we did back on April 17, 2010, when we were brand spanking new to the world of blogging. It is one thing to write about the perils of certain toxins after searching on the internet, it is another thing ENTIRELY to have an email sent to you, begging and pleading to share a little boys' heart-breaking story. It was this little boy, (Zack Flewelling), (who is now a grown man), who begged his Dad to contact me. This post is a TRUE STORY, and addresses how hazardous houseplants and flowers can be to our feline friends. When one hears a story that impacted someone else, it brings it that much closer and takes on an entirely different meaning. After I first posted this in 2010, I decided to make it a yearly tradition to share this post, (occasionally I will make additions to it). I am sure when Zack sees this post repeated, he will be thankful that this special message from his cat "Precious" lives on. It is good to retell this sad story so that hopefully it may help others not to have to suffer loss like that. This is such an important thing to be aware of, and that is such a sad story. BUT... I don't think a lot of people know how far toxins for cats go. Did you know that Rogaine can fatally damage a cat's heart? When my human found that out, she was shocked - I love to chew on her hair, and she would never put me at risk! So it's not only the poisons that people immediately think of, like rat poison, or lilies, or even cleaning products. Just look in your medicine cabinet, or even your kitchen cabinet. We kitties have a different system than humans, or dogs, and different things can affect us in really bad ways. Summer thank you for pointing those items out. I knew about household cleaners and of course medicines, gum, anything with xylitol........(however you spell it) I don't use Rogaine so I didn't know.....we have to be vigilant. I tend to be rather paranoid with things that can be harmful and I can tell you are too......sadly, the people who truly NEED to read these kinds of posts......will never see them. That is a heartbreaking story. When our cats are harmed by something we should have known about-- or COULD have known about-- it is even more wrenching. Such an important message even though it was a horrible time it was shared with love. Thanks for sharing this and you're right, we need to share the dangers as much as we can. Many people do not know. 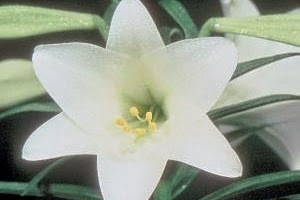 Years back, my sister's cat died the same way, unexpectedly, because of her husband's endearing but unknowingly dangerous habit of bringing her Easter Lilies because she loved them. Misty died a horrible death. It was a very sad time. This is such a sad story. I don't have any plants at home but I must confess I didn't know so many plants are poisonous for pets. This is such an important message that needs to be spread. Mom has had to throw some of her plants out! I will eat anything green so she did not want me to get sick! And My Mom hopes that everything comes out OK for your Mom tomorrow. Such a sad story. When our previous cats went in and out of the house, they never seemed at all interested in our large collection of house plants. Now that our cats are inside only, we've had to be very careful. Rufus is Inspector General, into everything! We carefully google plants before bringing them home now. Thank you for this life saving reminder! We need to remain vigilant, so our furry friends stay safe! So sad about Angel Precious. It is always a shame when a life is lost needlessly. I saved that infographic for future reference whenever we bring a plant into the house. Thanks for sharing. you are most welcome!! Thank you!! Great info. I do wish they'd put some type of warning or symbol on plants that indicate they are poisonous to pets. Thank you for sharing this again. It's so important for people to be aware be careful with what's brought into the house.